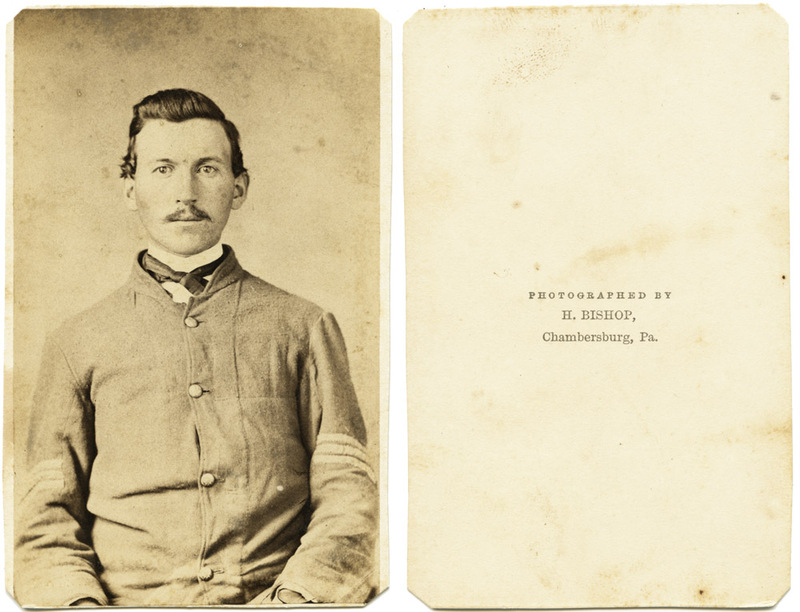 Here is a CDV of a Union solider from Chambersburg, Pennsylvania, my hometown. I found it on an excursion up to Gettysburg this weekend. Judging from his overall appearance of health and cleanliness, this was probably taken at the beginning of the war when he enlisted. When I saw the image in the display case, I felt a need to acquire it just because it was from Chambersburg. After doing a little collecting, I’m getting the impression that there was only one, or perhaps two photo studios in Chambersburg for most of the 19th century, as this H. Bishop seems to be the most frequent studio back mark by far. I’m starting a records search to try and identify the young man, as there weren’t THAT many sergeants in the units from the Chambersburg area. I’m thinking a trip to the Kittochtinny Historical Society offices is in order when the weather is warmer and they’re back to full hours (I think they close up for the most part in the wintertime as their archives are in the Old Jail and are not heated). The Old Jail, by the way, is well worth a visit if you’re ever passing through Chambersburg – the main part of the jail is a Georgian structure dating to at least 1818, and was in use as a prison at least into the 1960s, when one of my father’s partners in his medical practice would take calls to see patients being held there.